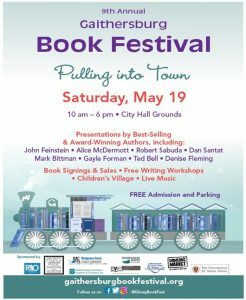 Since its inception in 2010, the Gaithersburg Book Festival has quickly become one of the nation’s top literary events, attracting hundreds of award-winning and best-selling authors, poets and songwriters from across the country to its quaint, park-like setting in the heart of Olde Towne Gaithersburg. The event was conceived and introduced by Gaithersburg Mayor (then council member) Jud Ashman, with the support of the Mayor and City Council and the Cultural Arts Advisory Committee. The Festival is produced by a core committee comprised of city staff and a dedicated group of volunteers who donate their time and talent. Funded in part by generous sponsors and supported by the City of Gaithersburg, the Festival offers programming for all ages, is free to attend and is open to everyone.